Canada’s Trudeau Plans to Work with Trump to Approve Keystone XL, Pump Exxon-owned Tar Sands into U.S.
At a speech given to the Calgary Chamber of Commerce, Canada’s Prime Minister Justin Trudeau said he intends to work withPresident-elect Donald Trump to approve the northern leg of TransCanada‘s Keystone XL pipeline. The speech comes as Trump revealed in a recent interview with Fox News that one of the first things he intends to do in office is grant permits for both Keystone XL and the perhaps equally controversial Dakota Access pipeline. Because Keystone XLNorth crosses the U.S.-Canada border, current processes require it to obtain a presidential permit from the U.S. Department of State, which the Obama administration has denied. The next State Department, however, could be led by the recently retired CEO of ExxonMobil, Rex Tillerson, who was just nominated to be U.S. Secretary of State and soon will face a Senate hearing and vote. Potentially complicating this situation is the fact that Exxon holds substantial interest in both tar sands projects and companies, which stand to benefit from the Keystone XL pipeline bringing this carbon-intensive crude oil across the border. Exxon, along with its subsidiary Imperial Oil, owns both the Kearl Oil Sands Project and Cold Lake tar sands production facilities, and a 25 percent stake in the tar sands production company Syncrude. According to Bloomberg, Trump’s team has shown interest in getting rid of the Executive Order which created the presidential permit process altogether, which President Barack Obama and Secretary of State John Kerry used in November 2015 to axe the pipeline. On the campaign trail and during his post-election “Victory Tour,” Trump has pledged to rescind all of Obama’s Executive Orders. Unsurprisingly, Tillerson has stated his support for Keystone XL, as well. As reported in a recent investigation by InsideClimate News, nearly a third of Exxon’s global reserves is situated in Alberta’s tar sands, an oil patch which covers about 55,000 square miles, or roughly the size of New York state. 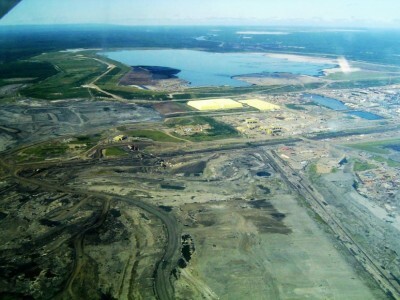 Alberta’s tar sands represent the third largest oil reserves on the planet. Processing and producing tar sands crude emits roughly 17 percent more carbon into the atmosphere than conventional crude oil, according to State Department figures cited by InsideClimate News. Exxon’s website says that by 2040 the company will provide a quarter of the oil for the Americas via the tar sands. It remains unclear what Tillerson will do pertaining to the 1.7 million shares of Exxon stock which will be deferred to him — “unvested,” in corporate lingo — over the next decade or so. Some industry experts have called for him to either receive his stock payments immediately or divest completely in order to avoid the associated conflict of interest as Secretary of State. Keystone XL North links Alberta’s massive tar sands reserves to the oil hub mecca of Cushing, Oklahoma. From there, it connects with the southern leg of Keystone XL — now known as the Gulf Coast Pipeline — which carries the diluted bitumen(or “dilbit,” the result of tar sands oil being mixed with lighter petroleum products to allow it to flow more easily) to Gulf coast refinery markets. Trudeau also recently gave a permit to the oil company Enbridge for its Line 3 Pipeline, which likewise crosses the U.S.-Canada border. That line to the Great Lakes connects to what DeSmog has called the broader “Keystone XL Clone” pipeline system, which like the Keystone Pipeline System, links Alberta’s tar sands to Gulf Coast refinery markets. The southernmost piece of this Keystone XL Clone system, the Seaway Pipeline, which runs from Cushing to Gulf Coast refineries, had a spill in late October.